Following Nick Pelling’s comment below, I have revised the proposed order of folios slightly within subquire C (flipped the outer folios). This post was inspired by a discussion on a Cipher Mysteries page presenting Nick Pelling’s “Block Paradigm” (read about it here: http://www.ciphermysteries.com/2014/12/07/introducing-the-block-paradigm-for-voynich-manuscript-research-part-1). The article and its lengthy comments section discuss the text on folio 81r and its layout. One of the many questions raised is: does the large blank margin on the right side of the page reflect the nature of the text, i.e a poem or song, or is it due to some other factor? Nick Pelling referenced a suggestion made years ago by René Zandbergen that the blank space may have been left by the scribe to leave room for a marginalia type of drawing which never ended up being added. With all due respect to Mr. Zandbergen, who has considerable expertise on the manuscript and whose website (http://www.voynich.nu/index.html) is a real treasure trove of Voynich-related information, I believe that this particular hypothesis of his can be disproven, as will be shown in the following paragraphs. Mr. Pelling has demonstrated that Quire 13 was originally in a different order than it is now, as evidenced by the connected tubs of 78v and 81r. His work with Glen Claston on the MS brought them to the suspicion that Quire 13 might best be viewed as consisting of two distinct quires. 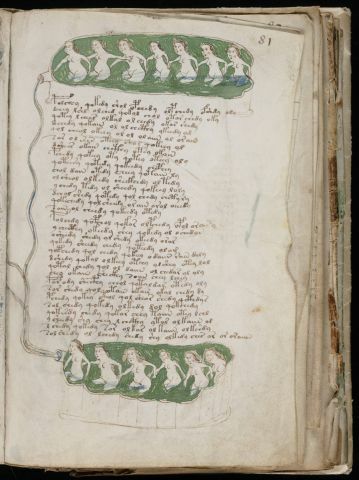 I recently found a page discussing this at Cipher Mysteries (http://www.ciphermysteries.com/2013/05/30/evidence-of-bifolio-reordering-in-the-voynich-manuscript), but it does not provide any link to Claston’s work and I was unable to find any online exposé of the reasons that brought him to consider Quire 13 as consisting of two subquires, (which they call 13a & 13b). C type folios feature large Central tubs with clearly visible “walls” and structured sides: these are man-made basins, sometimes connected with tubing. C type folios have no marginal drawings (no figures in the margins). M type folios feature pools which have no such walls but are marked by wavy edges, possibly indicating natural pools. M type folios however, feature plenty of man-made elements in their numerous Marginal drawings. It is also worth noting that while the nymphs in M are active, hold objects and carry out all sorts of interactions, the nymphs in section C are almost completely passive, just standing or laying in the water. Each folio’s recto and verso sides belong to the same category. On some folios there are central pools and marginal drawings, but in these cases the pools do not display structured tub walls like the others in the folios classified as C type folios, and they are therefore M types. When the bifolios are reordered to reproduce this order, we end up with two subquires, quire 13M and 13C. I believe M precedes C in the original ordering, because f76r, with it’s emphasized initial character and vertical key-like sequence of characters, make for a better header for the overall section. However, one or several bi-folios may be missing from 13C (Pelling says this was also postulated by Claston), so this cannot be known for sure at this point. Within each subquire the order of the bifolios is obvious, as sub-quire 13C necessarily has bifolio 78-81 as its center, however it may be missing folios, or could perhaps just tell a shorter “story” than the one being told in 13M. Returning to the hypothesis that 81r’s layout may have been intended as leaving room for marginal images, this can now be ruled out, as we can see 81r is a C type page, consistent with its other side 81v, and therefore was not intended to feature drawings in the margins. The layout is likely the result of the scribe’s avoidance of a stain in the margin, as suggested by “Job” in the comments section of the Cipher Mysteries article mentioned above, or a reflection of the nature of the text itself (poem, song, or other). If anyone has a link to Claston’s work on quire 13, please let me know, I’d love to read it!